UFO SIGHTINGS DAILY: Pyramid UFO Over Mountain In Clarens, South Africa, Photos, UFO Sighting News. Pyramid UFO Over Mountain In Clarens, South Africa, Photos, UFO Sighting News. This report just came in today. A person was taking photos of a hillside are of Clarens, South Africa and the first photo shows nothing in particular, however the second shows an upside down pyramid UFO. 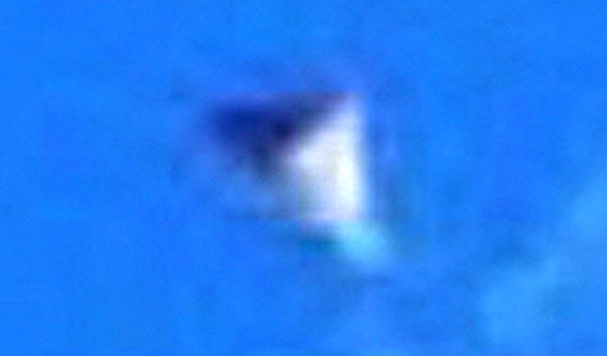 Close up of the UFO shows it has a grey metallic surface with perfectly symmetrical sides. Clarens is a small city of 6,300 residents. This is not an insect flying past, because there are no legs, wings or head. This is not a kite, because it was gone in seconds. I have heard of pyramid UFOs, but until now never seen one. The object appears to be directly above the mountain and is approximately the size of a small car. Its incredible speed of being caught in only one photo...is an indicator that this was an alien craft. Took 2 photos seconds apart. noticed the object years later.